Another busy weekend for me! Thursday I took off across the state to spend the weekend with my sister and her family. Her youngest daughter graduated from high school on Saturday and there was a BBQ party on Friday evening. On top of all that my daughter and the grandkids came up for the celebration too! Lots of commotion that is for sure. 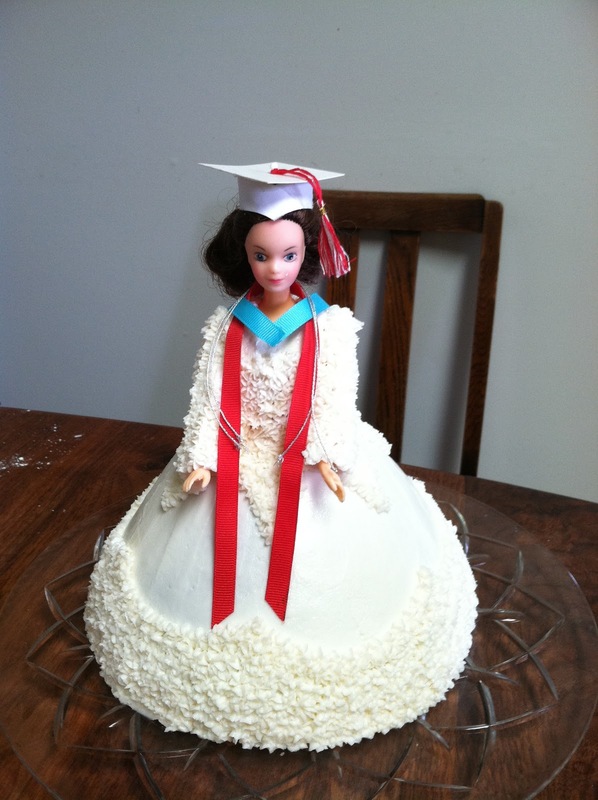 On Friday morning my job was to make a Graduation Barbie cake. My sister made the mortarboard, complete with tassel! She also created the sashes and cords out of ribbon and some silver cording to represent the sashes and cords my niece would have for graduation. I also added some paper sleeves and a section around the body to look more like a graduation gown instead of a ball gown. She turned out pretty well I think! 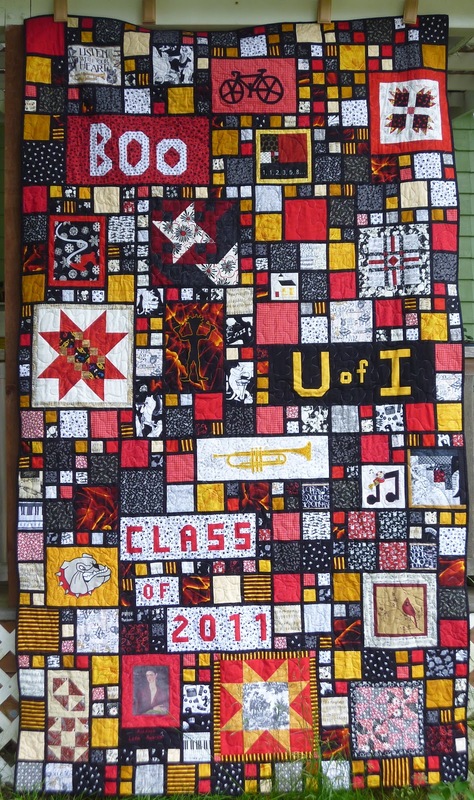 We also surprised my niece with this graduation quilt. There are blocks made by several quilters in her life that represent various interests of hers. Her high school colors were red and white and her college colors will be black and gold, hence the color scheme. The top was put together by my sister and I got the honor of quilting it. She was very excited about it and very surprised! On Saturday morning we took a walk to a local coffee shop and got coffee for the grown-ups and cocoa for the little ones and then walked over to the park so the kids could play and we could reserv seats with tape for graduation that afternoon. Just after we got home from our walk the skies opened up with rain and hail and wind so we had to postpone our trip the Fantastic Sam's for about an hour for my granddaughter's much needed hair cut - she had to tip her head back to see out from under her bangs! The sun came back out and stayed out through graduation which was awesome since graduation was held outside! After graduation we enjoyed a turkey dinner then my daughter turned over custody of the grandkids to me and headed home. Sunday morning the kids I headed out and met my other daughter and her husband for coffee and then strted our trek across the state. An uneventful trip filled with chatter and singing and a couple of stops at rest areas to let off some steam! We got home, got unloaded and the kids headed outside to see what was new. I started dinner and our son arrived home just in time to eat. We've been having fun at Grammy World including driving to the airport yesterday morning to drop my son off for his adventure to Korea to visit his girlfriend who has been back home in Korea for about 6 months. I was able to deliver one of my owl hats to a friend who was at the graduation party and got another finished. I now have two more of the main hats finished and I am working on the eyes and beaks so they can be put together and ready for delivery. I got a couple more orders so I still have 5 to get made! At least that is something I can work on while the kids are here.